I’m in it for the food and booze. How is October wrapping up this week? Halloween is Thursday night. I really wanted to have a costume this year since I could have fun and dress up the baby bump but I’m not having much luck coming up with a costume. We’ll see what I can come up with quickly so that I can get dressed up to hand out some candy. Oh yeah, and we can’t forget to get a costume for Kemper. ha! Since October is wrapping up it means it’s time to post this month’s recipe for my Secret Recipe Club post. This month I received the blog called The Wimpy Vegetarian. Susan’s blog is full of great recipes that feature fresh ingredients and vibrant flavors. As usual, Price picked the recipe for me to make for this month’s SRC post. 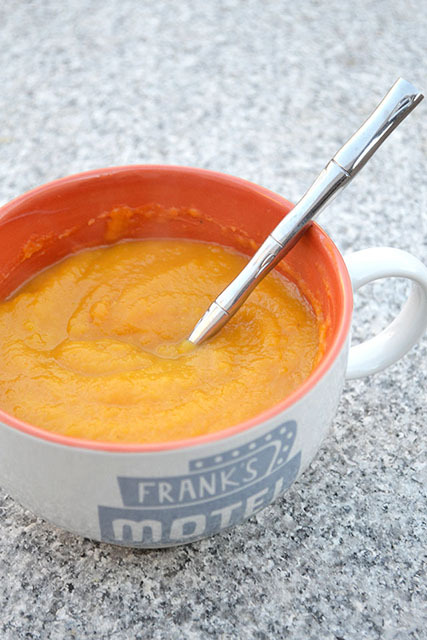 He was thinking fall when he picked the Butternut Squash-Apple Soup. 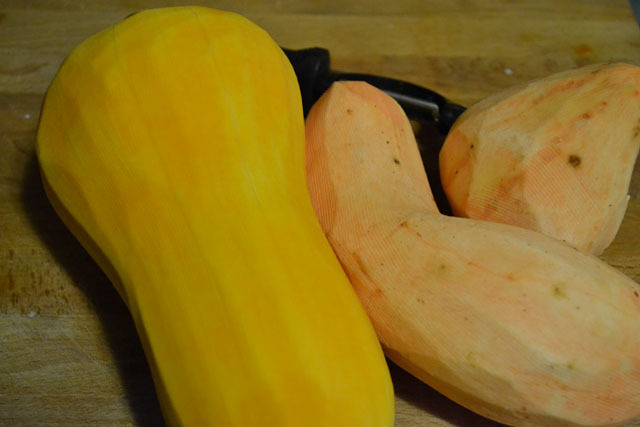 I’m so glad that he did because we had a monster of a butternut squash sitting on our counter just waiting to be used. I had been staring at it wondering what to do since it was so big. Seriously, it was about from my finger tips to my elbow. A little intimidating to say the least. But this soup ended up being the perfect fit for it. We loved this soup! It felt so rich without being indulgent. Can’t beat a healthy soup that is quick to make. It would be the perfect fit to make on a weekend or just after work. Even the dog liked the soup! It’s vegetarian so I just mixed a bit into his food and he loved it. I’m always trying to give him extra fruits and veggies as treats instead of processed treats so I figured I’d just give this a try as well and he LOVED it. I highly suggest making this amazing Butternut Squash-Apple Soup when you are craving a delicious soup that is simple to make and that will fill you up on fresh fall flavors. 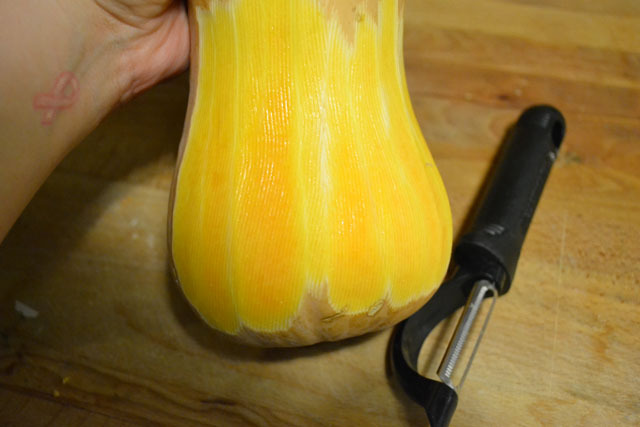 Peel and then slice off the top and bottom of each squash. 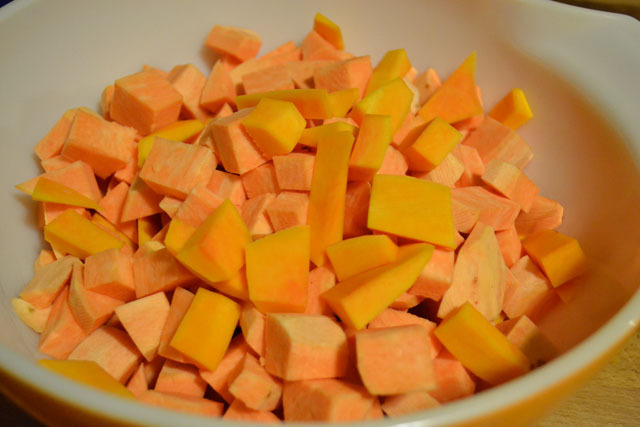 Slice in half lengthwise and scrape out the seeds and pulp with a spoon and then chop the squash into 1″ cubes. 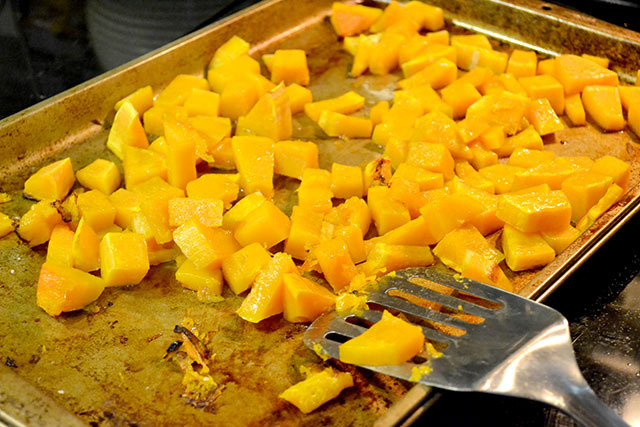 Toss the squash with a little olive oil, lightly salt, and spread on a baking sheet. Roast until very, very soft and lightly caramelized, about 30 minutes. In a very large pot, melt the butter over medium high heat and cook until lightly browned. 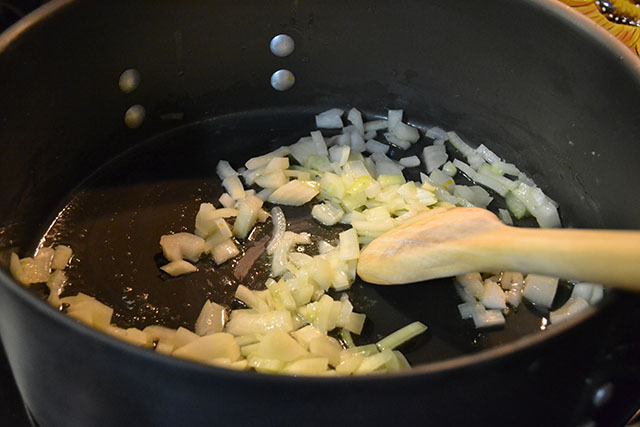 Lower the heat and add the remaining olive oil and the onion. 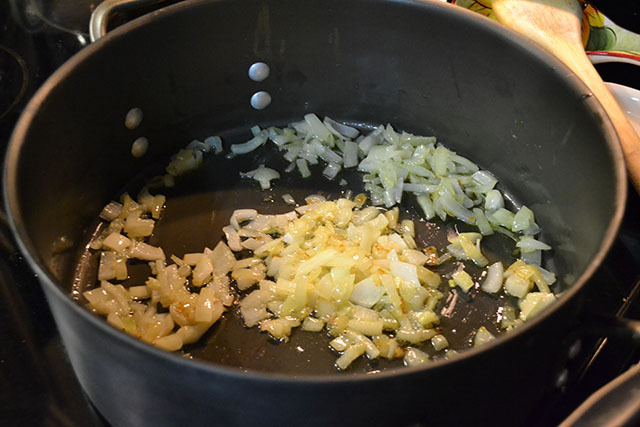 Saute for about 20 minutes or until the onion begins to caramelize. 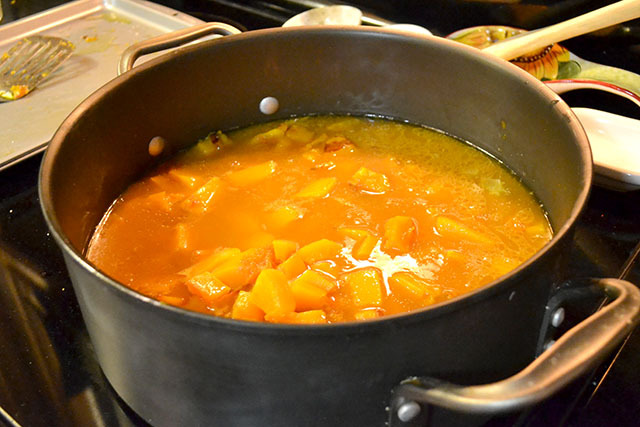 Add the squash, vegetable stock, apple cider, and salt to the pot, and bring to a simmer for 10 minutes. 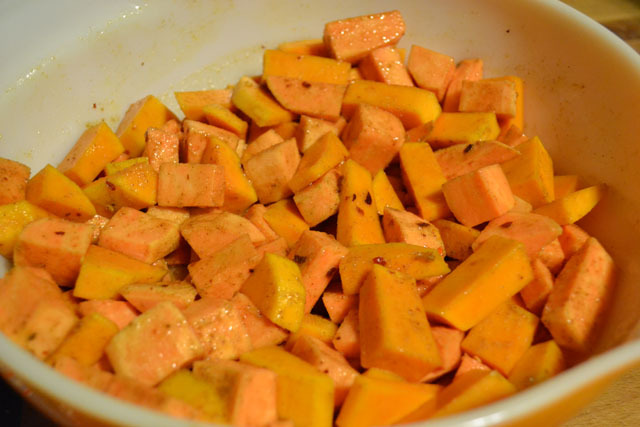 In small batches, pour the soup into a blender and puree to a smooth. Season to taste prior to serving. Check out my previous 2 years of Secret Recipe Club Posts. There is a restaurant and catering place a few blocks away from us called Bakers’ Best Cafe. We are typically so busy or away on the weekends that we don’t stick around our neighborhood, so it took us a few months to find it and go there. But since then we have been hooked! I order the Hash and Eggs (crispy homemade corned beef hash topped with two poached eggs and hollandaise sauce $9.50). It’s so good! My favorite brunch thing to get is Eggs Benedict, so this is a great spin on it. While I would love to go there whenever we are in town and not going at break neck speeds, I can’t always justify a $30+ brunch bill. And that not including the mimosas I have a habit of throwing back, which I can make at home for a fraction of the price. So I decided to make something at home that reminds me of the delicious meal I enjoy there. 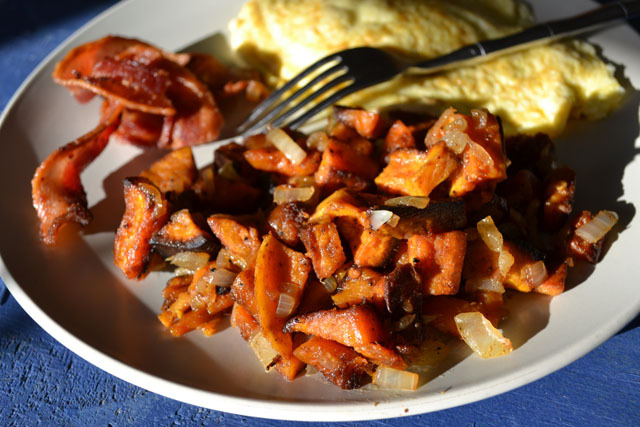 Making this sweet potato & squash hash is a simple way of doing so. I make this hash without corned beef in it because I don’t just have that laying around (who do you think I am?) and I’m looking for a simple recipe that I can do in my sleep. I think the key with this is letting the potatoes rest after being roasted because it softens up this crunchy pieces a bit. I don’t know about you but I hate super crunchy potatoes with my eggs, so letting them relax in the fridge over night solves that earth shaking problem. Also, it means you don’t have to get up super early to make this. 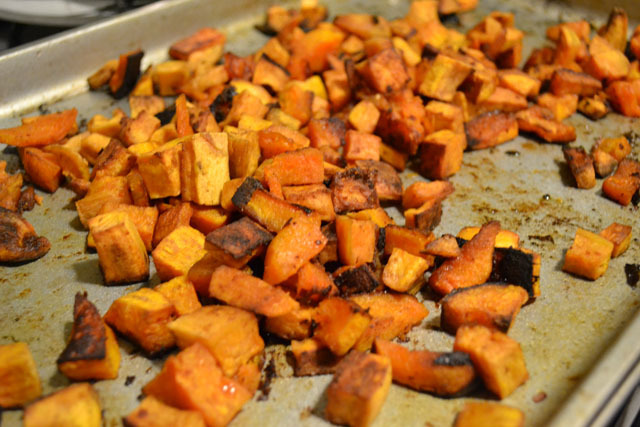 After so the dinner clean up, cut up the squash and sweet potatoes, ditch them in the oven to roast while watching SNL (& skipping the bits Kristen Wiig is in), throw them in a container and in the fridge before going to bed. 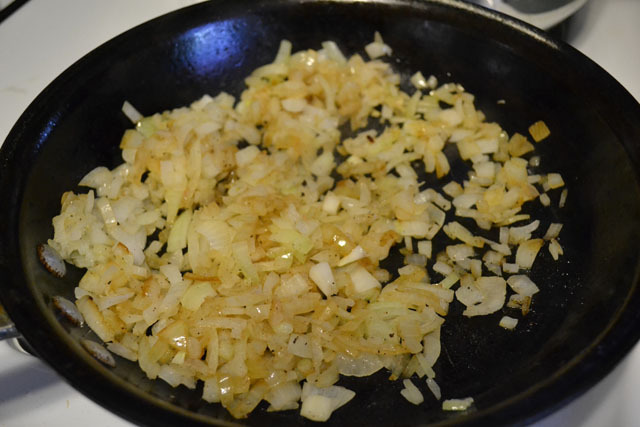 While making bacon, cut up and onion, then while your eggs cook sauté the onion and then add the rest of the hash to warm up. 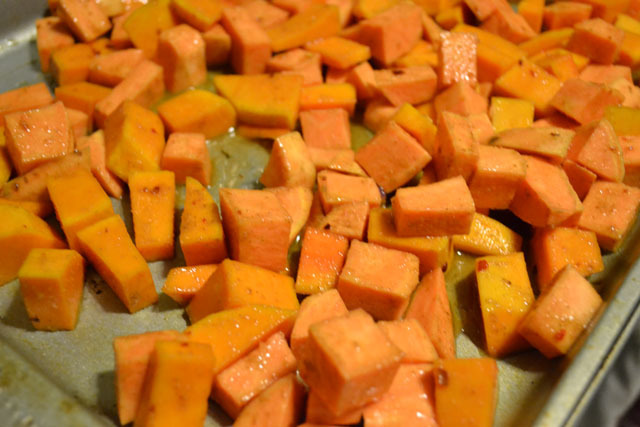 Cut squash and sweet potato in 1/2″ to 3/4″ pieces. Toss with oil, seasoned salt and crushed red pepper to evenly coat. Roast at 375 for 40-45 minutes, stirring half way. 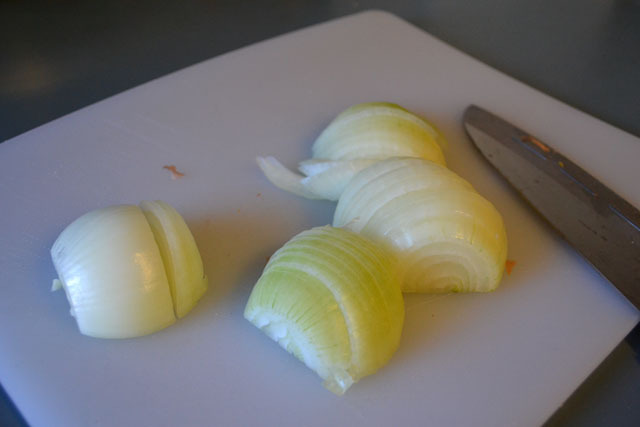 Prior to serving, chop up an large onion. 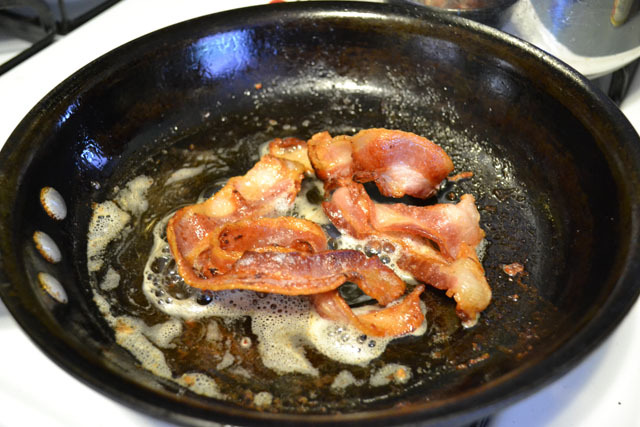 Saute in bacon grease until soft. 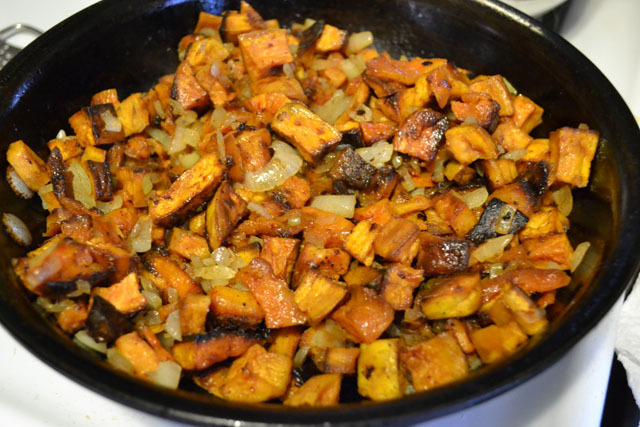 Add the cooked potato and squash mixture to the skillet and gently warm through. Serve with eggs and bacon. And a mimosa or bloody mary can’t hurt!